Astro Packaging has carts assembled with a boom and balancer to make your application process simple and flexible. The cart with boom and balancer helps you move your melt units anywhere so that your operation doesn't skip a beat! This easy to use added equipment gives the operator complete control of the application process. 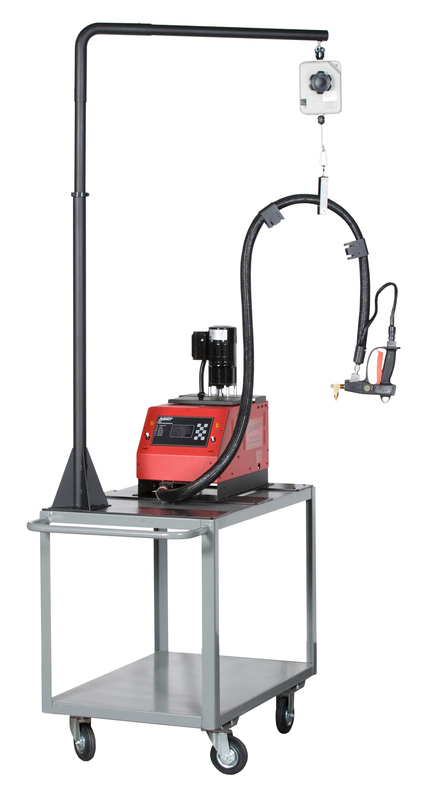 The cart is perfect for small melt units and gives the operator flexibility to move the unit to the best location for applying adhesive. The boom and balancer eliminates heavy lifting of guns and hoses to allow the user to easily apply glue with a top-down glue stream.